Area: 580,367 sq. km. (224,080 sq mi. ); slightly smaller than Texas. Cities: Capital: Nairobi (pop. 2.9 million; 2007 est.). Other cities — Mombasa (828,500; 2006 est. 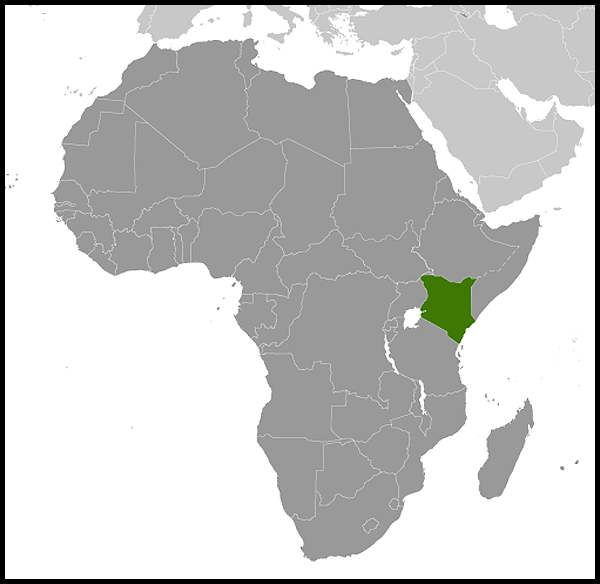 ), Kisumu (650,846; 2005-6), Nakuru (1.3 million; 2005-6), Eldoret (193,830; 1999). Nationality: Noun and adjective — Kenyan(s). Religions: Christian 82.6%, Muslim 11.2%, traditional African religions 5%, Hindu/Sikh/Baha'i/Jewish 1%. Education: First 8 years of primary school are provided tuition-free by the government. In January 2008, the government began offering a program of free secondary education, subject to some restrictions. Attendance — 92% for primary grades. Adult literacy rate — 74%. Health: Infant mortality rate: 57.4/1,000. Life expectancy — 55.3 yrs (2007 est.). Constitution: 1963; new constitution approved in an August 4, 2010 referendum. Branches: Executive: president (chief of state, commander in chief of armed forces), prime minister (head of government), and two deputy prime ministers. Legislative — unicameral National Assembly (parliament). Judicial — Supreme Court, Court of Appeal, High Court, various lower and special courts, including Kadhi (Sharia) courts. Administrative subdivisions: 140 districts, joined to form 7 rural provinces. 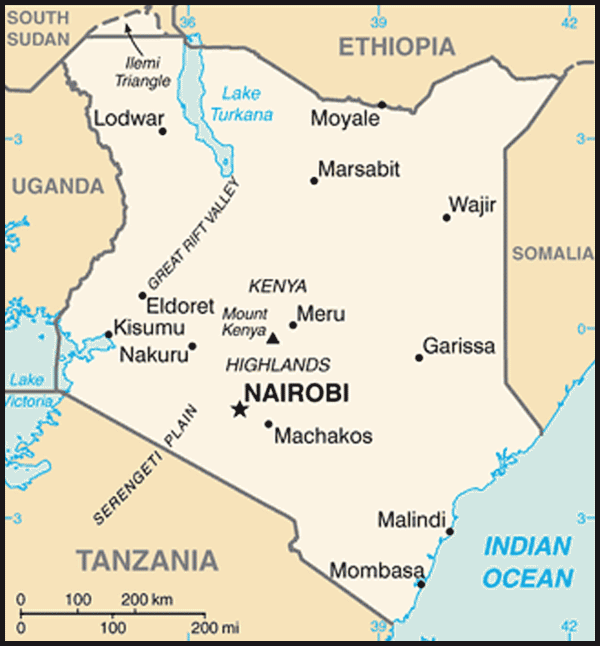 The Nairobi area has special provincial status. Under the new constitution, which is in the process of being implemented, the primary administrative subdivisions will be 47 counties, each with an elected governor. Political parties: Over 40 registered political parties. Two coalitions, the Party of National Unity (PNU) and the Orange Democratic Movement (ODM), dominate the political party scene. PNU membership is filled by parties representing Kikuyu and closely related ethnic groups; ODM membership ranks are filled by parties representing nearly everybody else. PNU and ODM agreed in February 2008 to form a coalition government in a power-sharing arrangement that ended the political crisis erupting after disputed national elections in December 2007. GDP (2010 est. ): $32 billion. Annual growth rate (2010): 5.4%. Gross national income per capita (2008, Atlas Method): $780. Agriculture: Products: tea, coffee, sugarcane, horticultural products, corn, wheat, rice, sisal, pineapples, pyrethrum, dairy products, meat and meat products, hides, skins. Arable land — 17%. Industry: Types: petroleum products, grain and sugar milling, cement, beer, soft drinks, textiles, vehicle assembly, paper and light manufacturing. Structure of economy (% of GDP): Services — 59.5%; industry and commerce — 16.7%; agriculture — 23.8%. Work force: Formal sector wage earners — 1.95 million (public sector 30%; private sector 70%). Informal sector workers — 6.4 million. Trade (FY 2010): Exports: $4.96 billion: tea, horticultural products, coffee, petroleum products, cement, pyrethrum, soda ash, sisal, hides and skins, fluorspar. Major export markets — Uganda, United Kingdom, Tanzania, Netherlands, United States, Pakistan. Imports — $11.6 billion: machinery, vehicles, crude petroleum, iron and steel, resins and plastic materials, refined petroleum products, pharmaceuticals, paper and paper products, fertilizers, wheat. Major suppliers — United Arab Emirates, China, India, South Africa, Japan, United States. Kenya has a very diverse population that includes three of Africa's major sociolinguistic groups: Bantu (67%), Nilotic (30%), and Cushitic (3%). Kenyans are deeply religious. About 80% of Kenyans are Christian, 11% Muslim, and the remainder follow traditional African religions or other faiths. Most city residents retain links with their rural, extended families and leave the city periodically to help work on the family farm. About 75% of the work force is engaged in agriculture, mainly as subsistence farmers. The national motto of Kenya is Harambee, meaning "pull together." In that spirit, volunteers in hundreds of communities build schools, clinics, and other facilities each year and collect funds to send students abroad. Kenya has six full-pledged public universities: University of Nairobi, Jomo Kenyatta University of Agriculture and Technology, Egerton University, Moi University, Maseno University, Masinde Muliro University (most of these universities also have constituent colleges); and approximately 13 private universities, including United States International University. Public and private universities have a total enrollment of approximately 50,000 students with about 80% of these being enrolled in public universities (representing 25% of students who qualify for university admission). In addition, more than 60,000 students enroll in middle-level colleges where they study career courses leading to certificate, diploma, and higher diploma awards. International universities and colleges have also established campuses in Kenya where students enroll for distance learning and other flexible programs. Other Kenyan students pursue their university education abroad. More than 5,000 Kenyans are studying in the United States. Cushitic-speaking people from what became Sudan, South Sudan, and Ethiopia moved into the area that is now Kenya beginning around 2000 BC. Arab traders began frequenting the Kenya coast around the first century AD. Kenya's proximity to the Arabian Peninsula invited colonization, and Arab and Persian settlements sprouted along the coast by the eighth century. During the first millennium AD, Nilotic and Bantu peoples moved into the region, and the latter now comprise two thirds of Kenya's population. Swahili, a Bantu language with significant Arabic vocabulary, developed as a trade language for the region. In October 2002, a coalition of opposition parties formed the National Rainbow Coalition (NARC). In December 2002, the NARC candidate, Mwai Kibaki, was elected the country's third President. President Kibaki received 62% of the vote, and NARC also won 59% of the parliamentary seats. 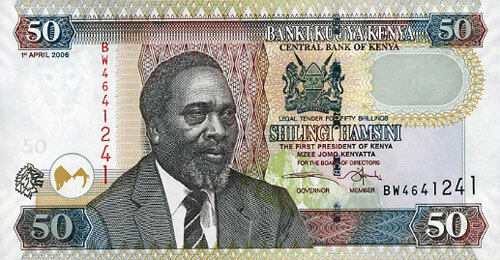 Kibaki, a Kikuyu from Central province, had served as a member of parliament since Kenya's independence in 1963. He served in senior posts in both the Kenyatta and Moi governments, including Vice President and Finance Minister. In 2003, internal conflicts disrupted the NARC government. In 2005 these conflicts came into the open when the government put its draft constitution to a public referendum — key government ministers organized the opposition to the draft constitution, which was defeated soundly. In 2007, two principal leaders of the movement to defeat the draft constitution, Raila Odinga and Kalonzo Musyoka — both former Kibaki allies — were presidential candidates for the Orange Democratic Movement (ODM) party and the Orange Democratic Movement-Kenya (ODM-K) party, respectively. In September 2007, President Kibaki and his allies formed the coalition Party of National Unity (PNU). KANU joined the PNU coalition, although it was serving in parliament as the official opposition party. On February 28, 2008, President Kibaki and Raila Odinga signed a power-sharing agreement, which provided for the establishment of a prime minister position (to be filled by Odinga) and two deputy prime minister positions, as well as the division of an expanded list of cabinet posts according to the parties' proportional representation in parliament. On March 18, 2008, the Kenyan parliament amended the constitution and adopted legislation to give legal force to the agreement. On April 17, 2008 the new coalition cabinet and Prime Minister Odinga were sworn in. The Kofi Annan-led political settlement also set out a reform agenda to address underlying causes of the post-election violence. The focus is on constitutional, electoral, land, and institutional reform as well as increased accountability for corruption and political violence. The new constitution was approved in a referendum on August 4, 2010. The judiciary consists of a Supreme Court, Court of Appeal, High Court, and Magistrates' Courts. The Chief Justice is the highest-ranking judicial official. The Supreme Court was established pursuant to the new constitution. Local administration is divided among 140 rural districts, each headed by a commissioner appointed by the president. The districts are joined to form seven rural provinces. Nairobi has special provincial status. The Ministry of State in charge of Provincial Administration and Internal Security supervises the administration of districts and provinces. Once implemented, the new constitution will result in significant changes to this structure, including greater devolution of power to 47 counties and creation of a second legislative chamber with responsibility for representing the interests of the counties and regions. Implementation of the new constitution will take several years, but these key changes in the structure of government should be in place in advance of national elections expected to be held in the second half of 2012. Kenya maintains an embassy in the United States at 2249 R Street NW, Washington, DC 20008 (tel. 202-387-6101, website: (http://www.kenyaembassy.com/) and consulates in Los Angeles and New York. Until post-election political unrest struck in early 2008, Kenya had, since independence, maintained considerable stability despite changes in its political system and crises in neighboring countries. This had been particularly true since the re-emergence of multiparty democracy and the accompanying increase in freedom (including freedom of speech, the press, and assembly). In early 2006, revelations from investigative reports of two major government-linked corruption scandals rocked Kenya and led to resignations, including three ministers (one of whom was later reappointed). In March 2006, another major scandal was uncovered involving money laundering and tax evasion in the Kenyan banking system. The government's March 2006 raid on the Standard Group media house conducted by masked Kenyan police was internationally condemned and was met with outrage by Kenya media and civil society. The government did not provide a sufficient explanation. No one has been held accountable. The December 2007 elections were marred by serious irregularities, and set off a wave of violence throughout Kenya. Following the February 2008 signing of a power-sharing agreement between President Kibaki and the opposition, a new coalition cabinet was sworn in April 2008, headed by Prime Minister Odinga. The 42-member cabinet became the largest in Kenya's history, including new ministries for cooperative development, Northern Kenya development, and Nairobi metropolitan development. Several ministries were also subdivided, creating a number of new cabinet positions. Constitutional reform that addresses the structure of government to create a more effective system of checks and balances is a key element of the reform agenda agreed as part of the power-sharing agreement. Following the process for producing a new draft constitution that was set out in the December 2008 Constitutional Review Act, Kenyans went to the polls on August 4, 2010 to vote on the new constitution. Reflecting broad support for fundamental change, 66.9% of those who voted endorsed it. The new constitution retains Kenya's presidential system but introduces additional checks and balances on executive power and greater devolution of power to the sub-national level. Fully implementing the new constitution will require passage of several dozen pieces of legislation over a 5-year period. The 2012 national elections will be the first conducted under the new constitution. The International Criminal Court has summoned six Kenyans (five high-ranking government officials and one radio executive) to The Hague on charges of crimes against humanity for their alleged roles in the 2007-2008 post-election violence. They appeared at The Hague in April 2011 to be informed of the charges. Confirmation of Charges hearings were held in September 2011. The Court is expected to announce its decisions on whether to confirm the charges and proceed to trial for each of the suspects in mid-January 2012. Kenya is the largest economy in east Africa and is a regional financial and transportation hub. After independence, Kenya promoted rapid economic growth through public investment, encouragement of smallholder agricultural production, and incentives for private (often foreign) industrial investment. Gross domestic product (GDP) grew at an annual average of 6.6% from 1963 to 1973. Agricultural production grew by 4.7% annually during the same period, stimulated by redistributing estates, diffusing new crop strains, and opening new areas to cultivation. After experiencing moderately high growth rates during the 1960s and 1970s, Kenya's economic performance during the 1980s and 1990s was far below its potential. From 1991 to 1993, Kenya had its worst economic performance since independence. Growth in GDP stagnated, and agricultural production shrank at an annual rate of 3.9%. Inflation reached a record 100% in August 1993. In the mid-1990s, the government implemented economic reform measures to stabilize the economy and restore sustainable growth, including lifting nearly all administrative controls on producer and retail prices, imports, foreign exchange, and grain marketing. Nevertheless, the economy grew by an annual average of only 1.5% between 1997 and 2002, which was below the population growth estimated at 2.5% per annum, leading to a decline in per capita incomes. The poor economic performance was largely due to inappropriate agricultural, land, and industrial policies compounded by poor international terms of trade and governance weaknesses. Increased government intrusion into the private sector and import substitution policies made the manufacturing sector uncompetitive. The policy environment, along with tight import controls and foreign exchange controls, made the domestic environment for investment unattractive for both foreign and domestic investors. The Kenyan Government's failure to meet commitments related to governance led to a stop-start relationship with the International Monetary Fund (IMF) and World Bank, both of which suspended support in 1997 and again in 2001. During President Kibaki's first term in office (2003-2007), the Government of Kenya began an ambitious economic reform program and resumed its cooperation with the World Bank and the IMF. There was some movement to reduce corruption in 2003, but the government did not sustain that momentum. Economic growth began to recover in this period, with real GDP growth registering 2.8% in 2003, 4.3% in 2004, 5.8% in 2005, 6.1% in 2006, and 7.0% in 2007. However, the economic effects of the violence that broke out after the December 27, 2007 general election, compounded by drought and the global financial crisis, brought growth down to less than 2% in 2008. In 2009, there was modest improvement with 2.6% growth, while the final 2010 growth figure was expected to be about 5%. In May 2009, the IMF Board approved a disbursement of approximately $200 million under its Exogenous Shock Facility (ESF), which is designed to provide policy support and financial assistance to low-income countries facing exogenous but temporary shocks. The ESF resources were meant to help Kenya recover from the negative impact of higher food and international fuel and fertilizer costs, and the slowdown in external demand associated with the global financial crisis. In January 2011, the IMF approved a 3-year, $508.7-million arrangement for Kenya under the Fund's Extended Credit Facility. To a considerable extent, the government's ability to stimulate economic demand through fiscal and monetary policy is linked to the pace at which the government is pursuing reforms in other key areas. The Privatization Law was enacted in 2005, but only became operational as of January 1, 2008. Parastatals Kenya Electricity Generating Company (KenGen), Telkom Kenya, and Kenya Re-Insurance have been privatized. The government sold 25% of Safaricom (10 billion shares) in 2008, reducing its share to 35%. Accelerating growth to achieve Kenya's potential and reduce the poverty that afflicts about 46% of its population will require continued deregulation of business, improved delivery of government services, addressing structural reforms, massive investment in new infrastructure (especially roads), reduction of chronic insecurity caused by crime, and improved economic governance generally. The government's Vision 2030 plan calls for these reforms, but realization of the goals could be delayed by coalition politics and line ministries' limited capacity. Economic expansion is fairly broad-based and is built on a stable macro-environment fostered by government, and the resilience, resourcefulness, and improved confidence of the private sector. Despite the post-election crisis, Nairobi continues to be the primary communication and financial hub of East Africa. 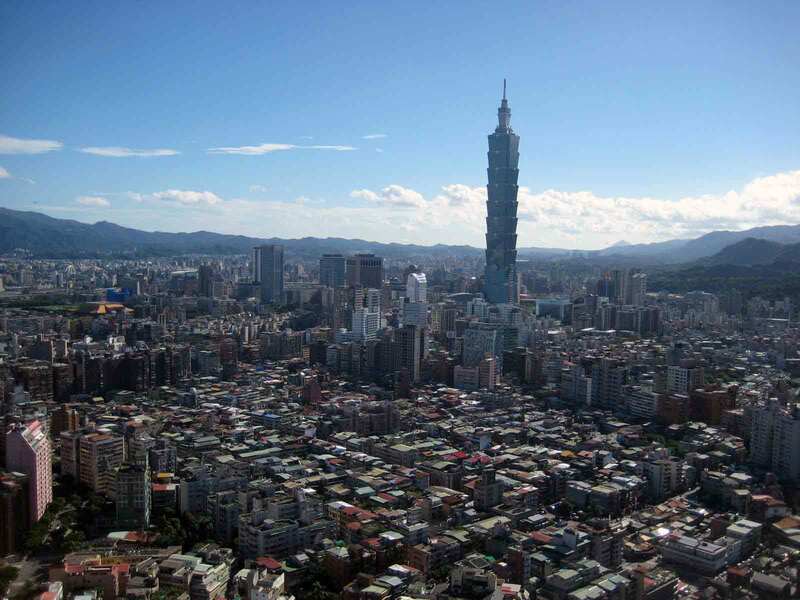 It enjoys the region's best transportation linkages, communications infrastructure, and trained personnel, although these advantages are less prominent than in past years. In FY 2010, tea was Kenya's top export, accounting for $1.15 billion. Fresh horticulture exports were $718 million, well short of the record high of $1.12 billion in 2007, in part due to unfavorable global weather conditions that affected air transportation. Tourism rebounded from the drop experienced in 2008 after the post-election violence, bringing in $807 million in 2009, an increase of 19% from 2008. In 2010, the Kenyan Ministry of Tourism recorded nearly 1.1 million tourists — an all-time high — and an 18% revenue growth, in local currency terms. Africa is Kenya's largest export market, followed by the European Union (EU). Kenya benefits significantly from the African Growth and Opportunity Act (AGOA), but the apparel industry is struggling to hold its ground against Asian competition. Currently there are 19 apparel factories, 1 yarn/fabric company, and 6 accessory companies (labels, sewing supplies, hangers) operating in the Export Processing Zones. Approximately 90% of Kenya's AGOA exports in 2010 were garments, and Kenya's garment exports under AGOA totaled $202 million in 2010 (a slight increase over 2009 but still well below the 2006 level of $265 million). Kenya does not systematically collect foreign direct investment (FDI) statistics, and its historical performance in attracting FDI has been relatively weak. The stock of FDI in 2005 was estimated to be about $1.04 billion, less than half of that in neighboring Tanzania. Net foreign direct investment was negative from 2000-2003, but started trickling back in 2004. The stock of U.S. FDI (at historical prices) was estimated to be about U.S. $180 million as of 2010. Remittances are Kenya's single largest source of foreign exchange and a key social safety net. According to the Central Bank of Kenya, recorded remittances totaled about $640 million in 2010; however, the actual number may be as high as $1 billion. Kenya is pursuing regional economic integration, which could enhance long-term growth prospects. The government is pursuing a strategy to reduce unemployment by expanding its manufacturing base to export more value-added goods to the region while enabling Kenya to develop its services hub. In March 1996, the Presidents of Kenya, Tanzania, and Uganda re-established the East African Community (EAC). The EAC's objectives include harmonizing tariffs and customs regimes, free movement of people, and improving regional infrastructures. In March 2004, the three East African countries signed a Customs Union Agreement paving the way for a common market. The Customs Union and a Common External Tariff were established on January 1, 2005, but the EAC countries are still working out exceptions to the tariff. Rwanda and Burundi joined the community in July 2007. In May 2007, during a Common Market for Eastern and Southern Africa (COMESA) summit, 13 heads of state endorsed a move to adopt a COMESA customs union and set December 8, 2008 as the target date for its adoption. On July 1, 2010, the EAC Common Market Protocol, which allows for the free movement of goods and services across the five member states, took effect. In October 2008, the heads of state of EAC, COMESA, and the Southern African Development Community (SADC) agreed to work toward a free trade area among all three economic groups with the eventual goal of establishing a customs union. If realized, the Tripartite Free Trade area would cover 26 countries. Kenya also has hundreds of FM radio stations, some broadcasting in Swahili or in local languages. Radio has a wide reach in Kenya, especially in rural areas. Some major international broadcasters, including British Broadcasting Corporation (BBC), Voice of America (VOA), and Radio France Internationale (RFI), rebroadcast their programming in Kenya. Despite internal tensions in Sudan and Ethiopia, Kenya has maintained good relations with them. Relations with Uganda and Tanzania are strengthening as the three countries work for mutual economic benefit. Kenya's economy, infrastructure, and relative stability make it an influential player in the region. Kenya played an active role in the negotiations to resolve the civil war in Sudan and has long been engaged in working to address instability in Somalia. On January 9, 2005 a Sudan North-South Comprehensive Peace Agreement was signed in Nairobi. In July 2011, South Sudan became an independent state. Negotiations in the Somali National Reconciliation Conference resulted at the end of 2004 in the establishment of Somali Transitional Federal Institutions (Assembly, President, Prime Minister, and Government). Until early 2005, Kenya served as a major host for these institutions. Between May and June 2005, members of the Somalia Transitional Federal Institutions relocated to Somalia. Faced with what it perceived as an untenable threat to its security and economy as a result of high-profile incidents involving kidnap and murder of European tourists, on October 16, 2011, Kenya sent military forces into Somalia seeking to push back extremist elements. Kenya has long borne a significant security and humanitarian burden resulting from two decades of instability in Somalia. Kenya is host to more than 600,000 refugees, most of whom are from Somalia. Kenya's relations with Western countries are generally friendly, although current political and economic instabilities are sometimes blamed on Western pressures. The United States and Kenya have enjoyed cordial relations since Kenya's independence. Relations became even closer after Kenya's democratic transition of 2002 and subsequent improvements in civil liberties. Approximately 15,000 U.S. citizens are registered with the U.S. Embassy as residents of Kenya. More than 100,000 Americans visited Kenya in 2010. About two-thirds of resident Americans are missionaries and their families. U.S. business investment primarily is in commerce, light manufacturing, and the tourism industry. Al Qaeda terrorists bombed the U.S. Embassy in Nairobi on August 7, 1998, taking hundreds of lives and maiming thousands more. Since that event, the Kenyan and U.S. Governments have intensified cooperation to address all forms of insecurity in Kenya, including terrorism. The United States provides equipment and training to Kenyan security forces, both civilian and military. In its dialogue with the Kenyan Government, the United States urges effective action against corruption and insecurity as the two greatest impediments to Kenya achieving sustained, rapid economic growth. U.S. assistance to Kenya is substantial. It promotes broad-based economic development as the basis for continued progress in political, social, and related areas of national life. The U.S. assistance strategy is built around five broad objectives: advancing shared democratic values, human rights, and good governance; fighting disease and improving healthcare; fighting poverty and promoting private sector-led prosperity; cooperating to fight insecurity and terrorism; and collaborating to foster peace and stability in East Africa. The Peace Corps, which usually has about 150 volunteers in Kenya, is integral to the overall U.S. assistance strategy in Kenya.